1. a living culture of multiple species of yeast and bacteria, grown to make a fermented beverage. 2. Also called kombucha tea, made by adding kombucha culture to sweetened tea. Mama Booch's Kombucha & Kefir Tonics are crafted locally in small batches and brewed in glass from organic teas and organic cane sugar. Mama Booch offers fresh, raw, living gourmet kombucha tea & water kefir. 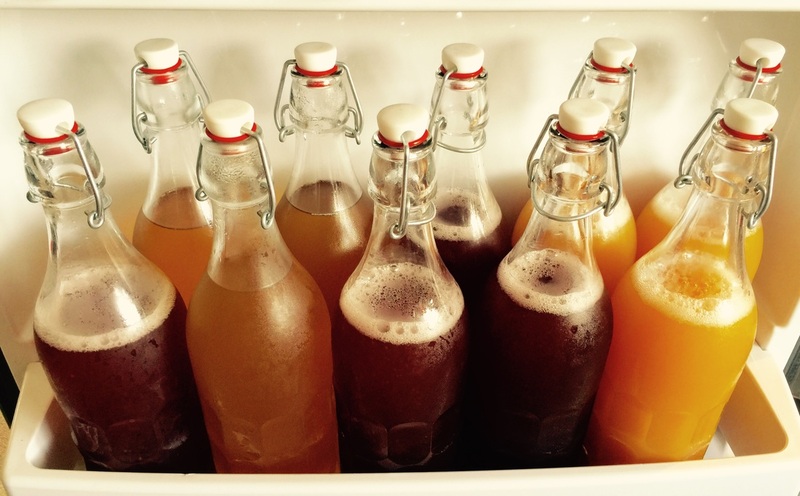 We flavor our kombucha & kefir using organic fruits, spices, and herbs, grown in-house or locally when possible. Our unique flavor combinations are refreshing and medicinal. For thousands of years, drinking tea has been a way for people and communities to come together and to also maintain health. With histories in China, Russia, Japan & Korea, oral history dates kombucha as a tea of “immortality” as far back as 212 BC in China. Kombucha tea is a positively charged, fermented, probiotic tea containing a variety of B-vitamins, beneficial bacterias, and acids. Regular consumption of kombucha is said to balance your center chi by creating a positive environment within your digestive tract. Kombucha helps your body effectively eliminate wastes and toxins before they can be absorbed into your blood stream. Drink kombucha tea for its positive energizing effects, for its health benefits, or just because it tastes so delicious! Water Kefir“grains” are not actual grains, but rather clusters of bacteria and yeast living in a symbiotic relationship and held together by a polysaccharide (dextran) produced by Lactobacillus higarii. These clusters look like translucent jelly crystals. The bacteria and yeasts in the grains utilize organic cane sugar to produce lactic acid, ethanol (a small amount), and carbon dioxide. Water kefir grains are known by a variety of names, but most commonly are called tibicos, Japanese water crystals, and California bees. They may also be referred to as Australian Bees, African Bees, Ginger Bees, Ginger Beer Plant, Sea Rice, or Aqua Gems, to name a few. Regardless of what name is given to water kefir grains, or the exact makeup of the culture, the technique for using them is basically the same throughout the world. If you cannot tolerate dairy, or if you are just looking for an alternative to commercial sodas, water kefir beverages can be a fun, easy, and tasty way to quench your thirst while adding more probiotics to your diet. Mama Booch's Energetic Water Kefir Grains were acquired at Dancing Rabbit Eco-Village in Northeast Missouri.